Ó Muireadhaigh - anglicised as Murray, and earlier as (O) Murrihy and Murry, means possibly -seaman/mariner or -lord. Mac Muireadaigh - anglicised Murray and Murry, and earlier as MacMurray etc. and the same possible derivations as the above name. Mac Giolla Mhuire - anglicised as Kilmore, Gilmore, Murry and Murray, meaning - son of the servant of Mary. Ó Muireadhaigh was the name of different septs. Woulfe, in 'Sloinnte Gaedheal is Gall' (1923), says the most powerful were in counties Roscommon (of the Uí Maine), Mayo, Westmeath and Cork. They were also found in Donegal and Cavan. The families are now widespread and dispersed. The chief of the Uí Maine sept appears in the 'Composition of Connacht' in 1585. Mac Muireadhaigh is of Co Donegal, and of Co Down, according to MacLysaght ('Irish Families' series 1980s) anciently in that county. 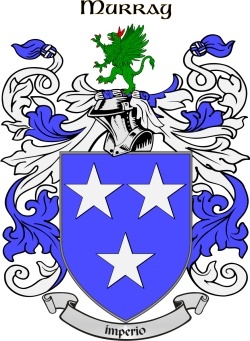 It has been suggested, too, that families of (Mac)Murray of east Ulster may come from a family of that name in Galloway, south-west Scotland; others in Ulster could be settlers from the Scottish Highland Clan Murray also. Woulfe adds that there was an old native Breffney (Leitrim) family of this name, who are recorded early in the 16th century 'Composition Book of Connacht'. The Registrar General's Report on Births in 1890 listed most in Dublin, Antrim, Cork, Down, Galway and Mayo. Donogh O' Murry was bishop of Athlone in the mid 15th century. Leave a message for Murray family members. Looking for info on a Reynard Murray, born in 1750 in Ireland, traveled to England and had a daughter named Margaret Murray born in Newcastle Upon Tyne Northumberland England in 1780, her mother was unknown, Reynard was her father... this is all info I have on Reynard, my fiance is a living descendant of Reynard and I would love to surprise him with more info.. thanks if anyone can help..
Hi, I'm at least the fifth generation Murray born in Manchester, England. I'm trying to find the source of my ancestors, and maybe the answer lies with the birthplace of my Gt Gt Gt Grandfather John Murray who is proving elusive. My line going back to him is Fred Murray (Mancs) son of Fred Murray (Mancs) son of John Murray (Mancs) son of James Murray (Mancs) son of John Murray (unknown). Any help or advice would be appreciated. hello,the murrays im looking for originate from galway and the west of ireland many left during the famine 1846,they married into a family called nestor,there was a patrick and jane murray,who would have been in there 40's when they left ireland and landed in new york,there are also murrays in canada and australia,two brothers timothy and robert went to australia with their famolies in the 1920's,any information at all would be appreciated,they were all roman catholics. Catherine Murray (b: Dec 4, 1831), along with Mary Murray (b: March 1827) and Daniel Murray (B: 1816). The siblings came to America in 1855. from Belfast to Wisconsin. With the age differences I would guess there are others. Catherine married Richard Fitzgerald from Buffalo County Wisconsin. Mary married Daniel O'Hearn from Waupan, Wisconsin. I have not found documents that name their parents or give info for more clues. Would like to connect them to Ireland. I am hoping to get going in the right direction. I am a 3rd generation American, but was adopted. I know my mothers maiden is Woodard. When I tried to look this up it keeps referring back to family name Murray. Any help would be wonderful. Just wanting to know more about my biological fathers family. His name is John warren Murray. His mother is Sheila Murray father Al Murray. He has two sisters, Rachel and Jennifer. I would like to know so when my daughter Alex has to do her family geneoligy at school I can tell her more than just my bio dads name, his parents and siblings. Please let me know. I am researching brothers my ancestor John Murray 1737-1790 and Francis Murray 1731-1816 out of Ireland probably Belfast and into Colonial America. John and Francis had a sister Mary Murray Tracey and a niece named NancyAgnes Martin widow of Daniel Martin. John, Francis, and presumably Mary were born in Ireland. Francis died in Newton, Bucks County, PA, and John died in Elkton, Cecil County, MD. John was a merchant and during the American Revolution was a privateer. Invite more Murray family members! Click 'Invite' to connect with more members of the Murray tribe.